Every summer I am finding myself becoming more and more thankful for things in my life. I've mentioned it before, but I am beyond thankful for my amazing friends. I am so thankful to live in such a fantastic city that has so many fantastic cultural events and that we live in a neighborhood that is almost walking-distance to the majority of them. And air-conditioning....I am thankful for air-conditioners......holy Texas heat. Our dear friend Kayleb recently accepted a position with the Fort Worth Symphony Orchestra, so we have gotten the opportunity to attend a few Concerts in the Gardens performances, which are held at the Fort Worth Botanic Gardens. It's always been a favorite summer-time activity for me and I was excited to get to share it with Ruby. Ruby, Me, and Kayleb at the Old 97's Concert - super excited that Kayleb was able to join us for the performance! "Mommy, remember the concert with all the muuuuusic.......and all the laaaasers.........and all the coloooorrrrrs.......and all our friennnnds.........AND THE FIREWORKS?!?!?!?!" "Yes, Ruby, that was so much fun, wasn't it?" "Mommy, it was so fun and so beautiful and so music-y. Can we go again tonight?" Ruby has attended two performances this year - the first one was the music of John Williams (i.e. Star Wars, Harry Potter, etc)performed by the FWSO, and the second one was the Old 97's Concert. For each of them we had a VIP Table and valet parking (thankyouthankyouthankyouthankyou Kayleb!). 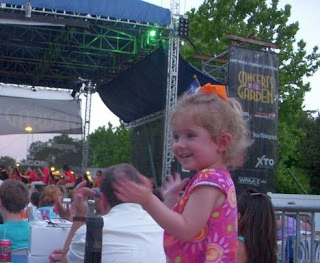 Ruby loved both of them, but really had a ball during the symphony performance. 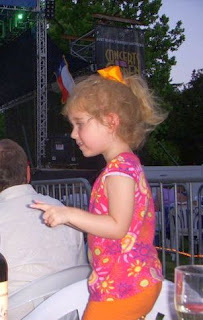 She was imitating the conductor - and had everyone near us cracking up! The girl has got some rhythm!!! With Tom, who is totally normal, I promise. 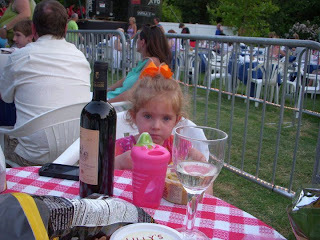 Silly Ruby, sippy-cups are not for Cabernet!